On July 2, 1964, President Lyndon Johnson signed the most sweeping piece of American civil rights legislation of the century, the Civil Rights Act of 1964. 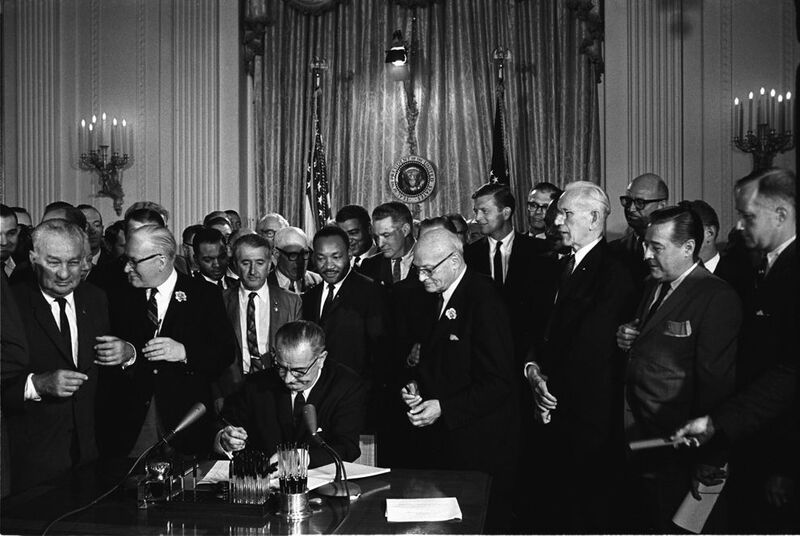 President Lyndon Johnson signs the Civil Rights Act of 1964. You may recognize the civil rights leader directly behind Johnson—it's Martin Luther King, Jr. The other African Americans in the photo are Ralph Abernathy (directly behind King) and John Lewis (to the left of Abernathy). On July 2, 1964, President Lyndon Johnson signed the Civil Rights Act of 1964, calling on U.S. citizens to “eliminate the last vestiges of injustice in America.” The act became the most sweeping civil rights legislation of the century. The Civil Rights Act provided legal recourse for discrimination in schools, public facilities, and conflict resolution. Its section on voting rights was strengthened a year later by the Voting Rights Act. Although majorities in both parties supported the Civil Rights Act, its passage altered the political loyalty of many areas in the South, where opposition to the law was strongest. The South had traditionally supported the Democratic Party, but became a Republican stronghold within 20 years of the act’s passage. “I know the risks are great, and we might lose the South, but those sorts of states may be lost anyway,” said Johnson, a native Texan. access to help or protection. historically, or established by custom. (1965) American legislation outlawing practices designed to prevent eligible voters from voting.